I’m leading two groups of women (a Wednesday morning and evening group) through Stormie Omartian’s The Power of a Praying Woman. We started two weeks ago and are all loving it! I look forward to seeing how this study deepens our prayer lives, especially my own! Each week we end the study praying in small groups of 4-5, NOT sharing prayer requests, but each gal praying for one concern of her own and one concern of the sister who prayed just before her. This has been an amazing exercise in prayer and community! Thank you for sharing this idea on prayer in a group- I love it! That is so cool. I’m sure everyone is getting so much out of that. Growing in your prayer life is so important. We all need that! This is a great idea 🙂 I love it!! March 5th we start Beth Moore’s, A Woman’s Heart God’s Dwelling Place about the Tabernacle. I’ve participated in this study with another group, but this time I will be facilitating the ladies at our church. Looking forward to what God is going to teach us. I just finished this study on my own. What a blessing! God is so awesome and it is our privilege to meet with Him in His Most Holy Place. Thank you Jesus! Already loving seeing God connect His Word to my daily life! Just this am had opportunity to talk about FAITH using Genesis examples w 10 yr old son home today. God is amazing! Also going through Genesis in Bible Study Fellowship. I love how the old familiar stories of Adam and Eve, Noah, Abraham are so relevant to my life today. God’s Word never disappoints! We’re starting Jonah by Priscilla Shirer this Thursday! Our group did this last year and loved it! We learned so much about changing our perspectives and following God’s will. Our ladies Bible study at my church has just begun Lisa Harper’s “Malachi” study. I’m excited to see how God is going to speak to us through Lisa. Malachi is one I would LOVE to do! Can’t wait until the opportunity arises…..or maybe I need to make it happen. Maybe this summer. I am praying we are all forever changed and grow closer in our spiritual journey with Jesus Christ. I am facilitating this study and just want to the words of my mouth and the meditation of my heart be acceptable in Thy Sight. Thanks. You won’t waste a prayer on me either. I am in a place in my life where I am looking for breakthrough and some big answers from the Lord; I’m looking forward to seeing how God is going to move and what my Promised Land is going to look like! WOW! What a great picture of the Tuesday night Bible study group!! I wish I could share a pic of one of my groups on here too in this comment. 🙂 But it’s not nearly as big. Lol! I have the honor of leading 3 fantastic groups out here in the very cold Saskatchewan Canada winter 🙂 There are about 90 ladies in all – with 10 sweet sisters just going through the workbook on their own because their schedules didn’t permit them to join a group. We are journeying through Stepping Up. What an incredible pilgrimage!! It’s a very unique pilgrimage for 10 of us as we will be travelling to Israel in March. This will be my 4th group that I’ve gone with and Arie Harel has been our tour guide each time! ♥ So, this study is especially dear to me. 🙂 I resonate with so much of what is in the workbook – the photos, videos and all. 🙂 We are all so very very blessed by this study! Learning and growing so much!! Thank you God for giving Miss Beth this study to write. I am doing two online studies by Wendy Pope of Proverbs 31 Ministies. The first…RTW 2013…follows the NLT Chronological Daily Bible readings. For each days selections…we choose Something New that we never saw before…Something Old that we remembered or gained new perspective on…and Something to Do..to apply these understandings. The other…is a Psalm Study…and begins February 2. This looks to be slower paced with a week of activities centered on each Psalm. Also debating joining a new study at Church based on Jennie Allens DVD series STUCK. could you provide a link to where you can get involved with the online study that coincides with the chronological daily Bible readings? An icon at the bottom of the screen will route you to the store where you can enroll for membership and access to the daily teaching videos. I am most looking forward to hearing how 2 friends in TN are using my new book along with their Beth Moore Bible studies. Not just those 2 friends, but them working it with their study groups. And 1 group in Alabama that I know of also. Hahahaha!! Hi Kathy! Feels like I haven’t talked with you in a long time. I do like the Sbux Peppermint Mocha, it just does not mix well with anxiety. Just got back from the cardiologist. Heart is fine, it’s likely stress, so coffee would probably not help so much, haha. About to begin James by Beth Moore: Monday nights and Tuesday mornings. We usually do a Beth study this time of year. It warms our hearts during the deep freeze and Spring’s new growth coincides with the growth we always experience from a Beth study. Looking forward to all the growth in each one that does it. In my preparation I have been swept off my feet by what God is doing. Yahoo! Monday evening – tonight is week 2 of Daniel by Beth Moore. I’m facilitating. It’s my 4th time through. Still great stuff and so exciting to see the other women enjoy! Wednesday morning – Colossians. We are just reading, memorizing, researching and coming together to discuss a chapter a week. Most looking forward to . . . Priscilla Shirer simulcast on Gideon in April. Doing the Priscilla Shirer Gideon Bible study with a group this summer. Living Proof Live in Springfield, IL in October. Bible Study: I have reluctantly submitted to God’s call for me to lead women’s Bible study in our church. We are on our third study and currently doing Beth’s Deuteronomy: Law of Love study. We are on our third week tonight! What are you most looking forward to? I’m so looking forward to the way God reveals His love for each and every one of us, that we may never forget! I’m praying for God to show me how to love him with every bit of who I am in a way that is so foreign to those around me, that I would fully rely on His outpouring of love for me each day to live a tremendous life for HIS GLORY! What I’m looking forward to? : Going deeper into God’s word than I ever have before. And discovering new things about myself to change so I can live in greater freedom through God. Lauren, Kentucky, I’m working through Malachi by Lisa Harper on my own. I’m also participating in an online group studying Luke through Good Morning Girls. I love reading what others are studying. How is it going through Malachi on your own? Do you miss having input from others? I’ve never done a Bible Study by myself, but have considered it. I am facilitating Anointed, Transformed, Redeemed at Wenatchee Free Methodist beginning next week. I am looking forward to digging into the scripture and studying the life of David with a great group of ladies. I’m looking forward to seeing the promises of God unfold and overwhelm my heart with His love and truth! Bible Study: I am participating in a Thursday night Bible study, Stepping Up, by Beth Moore. We have 25 women – how GOD is calling us all. What are you most looking forward to? I am looking forward to watching the women in the group/study commit their lives to GOD and take the next step in their journey. God is doing some amazing things and has a place for women all over. Let’s Step Up! Monday night: Going thru Psalms with 7 versions of the Bible-each version read by 1 member. Looking forward for the Truth to change all our hearts, to taste the LORD and see that He Is Indeed GOOD!!! I will be participating in a Tuesday night Bible study, True Learning-Bee Wise. This is a nine-week study on developing intimacy with God and learning to listen to Him. This study is the beginning of an intensive program in the spiritual formation of the Believer. There is a two-fold purpose that we desire to accomplish. One, that the individual’s relationship with Christ is brought to an even deeper level of intimacy and communication with Christ; and secondly, that the believer is equipped and prepared to guide and instruct others in the understanding and application of the exchanged life truths. Is this something we can all get our hands on? Or is it some sort of local series type thing? My small group is doing Daniel. We are on session 3 this week. I am looking forward to learning! And spending time with my sisters in Christ. I am leading believing God for my Sunday school class. And personally I’m doing Nehemiah by Kelly Minter. I really need the reminders from Believing God. That study changed my life when I did it the first time. I so want to give my ladies the joy that comes from truly believing God. I am doing Believing God too with a group of about 10 woman. Only in week 2, but already loving it. I did Nehemiah in my home last summer with 4 other ladies. It was awesome! I hope you have downloaded the videos from Lifeway that Kelly did for this study. I guess you could do it without the videos, but they are so great. You might check it out if you don’t have them. They aren’t too pricey. Also, you might want look back at the archives of this blog, starting towards the end of June, 2012. Beth did short videos every other week on this Nehemiah Bible Study. She asked such helpful questions that just added to the already awesome study. Having said all that, maybe you already know it. Have fun with your Bible Studies and I pray God will make himself known to you and help you know what it in your heart. We just started Ann Voskamp’s study and then we have a A woman’s dwelling by dear siesta mama for after. I am just so glad to be back in the word with my gal pals. We had an extended break and it was hard to do study without them. We start the Law Of Love this Sunday night with our Sista Mama! We are also doing The Story church wide since September. On Wednesday nights I am participating in the new study by Beth Moore, “The Law of Love” at our church womens group. 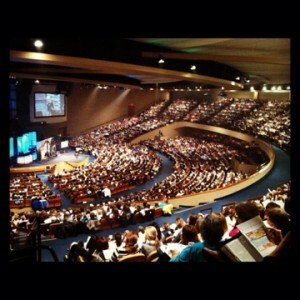 On Monday mornings I am participating in the Beth Moore Study on oneplace.com “The Book of Romans”. I am also participating in the 2013 Siesta Memory Team. It is my desire to grow closer to our God and build my faith in Him. I am also praying that God will show my where He wants me in His ministry. A study of Ezekiel and Nehemiah. I’m looking forward to the building of my spirit as we study the rebuilding of the broken walls and faith of the Israelites. Working Womens Bible Study meets every Thursday night from 6:30 to 8:30 p.m. We are studying Revelation for the second time! Thank you Beth for your ministry and your gifts!!! We love you in Urbanna, Virginia. OOPS! EZRA, not Ezekiel. Where be my mind? This is an amazing study this year. God is showing me so much. He is El Shaddai. He does not want me to run ahead of Him, but to let Him show me how He will fulfill things in His way and His timing. Nothing is impossible with Him. Just started Beth’s Daniel study with a group of 20+ ladies. Praising the Lord for His presence “on the page”, as Beth says. I am leading a large group of women through Believing God, (by Beth Moore) and we start tomorrow! So fun to see all the smiling faces as we start fresh again. I took it 6 years ago and our women’s ministries has offered most all of the Beth Moore studies over these last 6 years, but many women missed this one, so we are doing it again. Can’t wait! All of us having a more fervent faith and a BIG new level of Believing God and trusting Him for what He can do in each of our lives individually and corporately as a group in the greater forever family of God! Doing “Becoming a Woman Who Loves” by Cynthia Heald with my friend Susan. I am looking forward to learning more about God’s love and how to love others (especially the difficult people…). The fellowship is a blessing, too! James by Beth Moore and I’m so ready and excited I can hardly stand it! Tomorrow our women’s group is starting the Jonah study by Priscilla Shirer. I’m most looking forward to digging into God’s word to see what Jonah can teach us – the good and the bad. I’m also looking forward to getting to know and connect with our women’s group more deeply. I am facilitating two groups of women (a morning and an evening)through Beth’s Daniel study. I am leading a group of women at our local women’s shelter through Jennie Allen’s Stuck. Praise him for his blessed Word!! I am looking forward to the growth in each of our lives and as we let God’s Word change us. I just ordered Kelly Minter’s Nehemiah. I’m looking forward to digging into the Word this winter and hoping my heart will be broken for the things of God. Bible Study: Our Tuesday morning Bible Study at Real Life Church in Sacramento has just started Kasey Van Norman’s study, “Named by God”. We are in week one, and I have already heard from many the impact their personal study time with God is having on their hearts. I am so excited to see these women come to life as they embrace the healing hand of God and live in the full redemption of His Grace. Our women’s group at church started The Inheritance by Beth Moore in January. Very good. I had already started Malachi by Lisa Harper and I am loving it. So good! I am in a women’s Bible study group doing Beth’s “Here – Now There – Then” on Revelation. We all are looking forward to Beth’s take on this confusing book in the Bible. If anyone can explain it, Beth can! For those ladies who are studying Beth’s “Daniel” — that is a difficult study, so pray your way through it, and stick with it. Don’t give up! For those ladies doing Beth’s “Stepping Up”, I hope you enjoy this study as much as I did! I loved learning more about the temple in Jerusalem! Our Wednesday Bible Study starts this week, “Jesus the One and Only.” I’m so ready to get this party started, I miss by Bible study time!! I was invited to join the ladies of Eagles Nest Church of God to participate in this study on Thursday nights. I’m starting the 2nd week and LOVE it!!! Best Bible Study I’ve done so far! Love, love, love Esther. I am only on the 2nd week of this study but I am truly LOVING this study!!!! I’ve learned so much in the past two weeks!!! I am excited to study each and everyday!!! We finished the Revelation study by Mrs. Beth last Tuesday. Next Tuesday we will begin Captivating by John and Stasi Eldredge. I am looking forward to growing more in my walk with Christ. Bible Study: The Mind of Christ – Have only 1 more week, it has been a great study. I can not wait to get back to one of the Beth’s studies, I just love her format, and I seem to really apply to my daily living. Continuing to dig into God’s word! Thought I’d pop in & tell you that James McDonald from Harvest Bible Chapel just completed a 3 week series on Peace of Mind. It is AMAZING!! Just go to their website & you can listen. Worth the time, really!!!! I will check it out…. Thank you for sharing! On Wednesday nights our Bible Class of Women at church is starting the study “If You Want To Walk On Water, You’ve Got to Get Out Of The Boat”, by John Ortberg. I don’t know much about this study yet as I am not the facilitator, but praying I will trust more in Jesus and believe that with HIM I can walk on water!!! Both are getting me so excited!!! May HE BE GLORIFIED!!! WOO-HOO!